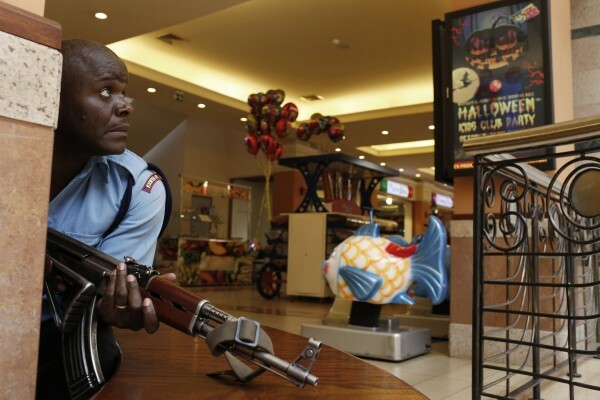 A soldier from the Kenya Defence Forces holds his gun as he arrives at the Westgate mall in the capital Nairobi on Sunday, Sept. 22. 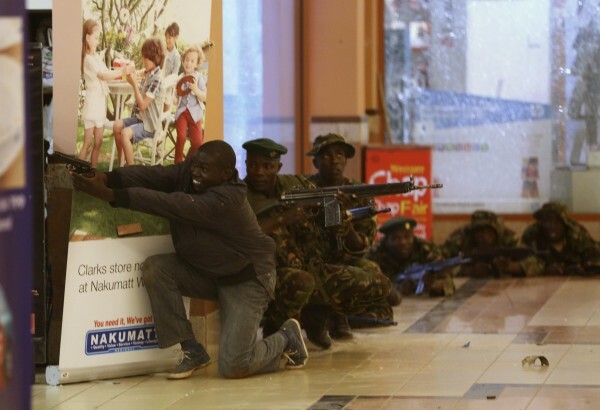 Soldiers and armed police hunt gunmen who went on a shooting spree in Westgate shopping centre in Nairobi on Saturday, Sept. 21. A wounded woman reacts after escaping a shooting at Westgate shopping center in Nairobi on Saturday, Sept. 21. A police officer tries to secure an area inside ta Nairobi shopping center where gunmen went on a shooting spree on Saturday, Sept. 21. 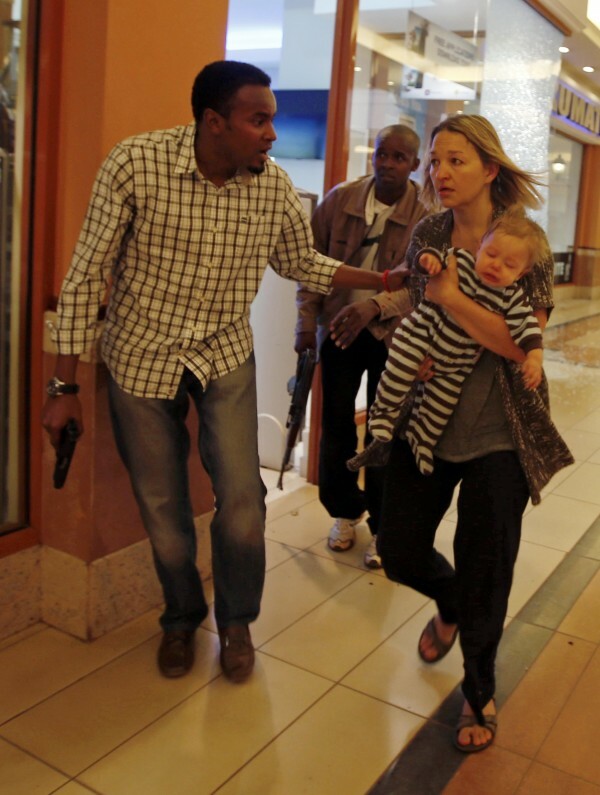 Armed police guide a woman carrying a child to safety at Westgate shopping center in Nairobi on Saturday, Sept. 21. 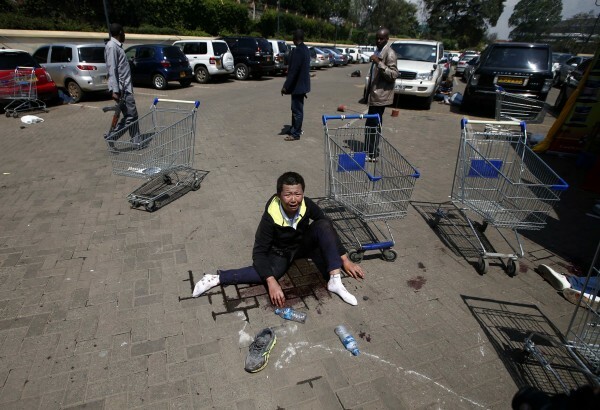 A wounded man sits screaming in shock at a parking lot of Westgate mall in Nairobi on Saturday, Sept. 21. NAIROBI — Islamist militants were holding hostages on Sunday at a shopping mall in Nairobi, where at least 68 people were killed in an attack by Somalia’s al Shabaab terrorist group. The al-Qaida-affiliated movement demanded Kenya pull troops out of its northern neighbor, where they have pushed al Shabaab onto the defensive over the past two years. There was no word of other demands from the dozen or so gunmen — and possibly women — said to be barricaded in a supermarket with an unknown number of captives. One Kenyan TV station said 30 were still being held, nearly 36 hours after Saturday’s devastating assault. Brief volleys of gunfire and a blast interrupted a day of stalemate. A Reuters correspondent saw security personnel on the move and, as dusk closed in, two helicopters swooped low over the Westgate shopping center, which has several Israeli-owned outlets and is frequented by prosperous Kenyans and foreigners. Volunteers said they believed more bodies were still inside, unreachable for now. But despite a Twitter comment from a Kenyan security agency suggesting an imminent operation, the evening passed with little sign of action. British Prime Minister David Cameron, confirming three Britons were dead, said: “We should prepare ourselves for further bad news.” President Barack Obama called President Kenyatta to offer condolences and support. Previous such raids, in Russia, the 2008 Mumbai attacks or January’s al-Qaida assault on an Algerian gas plant, have generally ended with many hostages losing their lives. Foreigners including a French mother and daughter and two diplomats from Canada and Ghana were killed in Saturday’s attack, which was claimed by al Shabaab. Other victims came from China and the Netherlands. U.S. citizens were injured. Scores of Kenyans gathered on Sunday at a site overlooking the mall, awaiting what they expected to be a violent denouement. “They entered through blood, that’s how they’ll leave,” said Jonathan Maungo, a private security guard. Kenyatta, facing his first major security challenge since being elected in March, said he lost a nephew and his fiancée in the raid and vowed to defeat the militants. But the heavily armed and well-disciplined attackers, still unidentified, had shown no hesitation in killing civilians. The spokesman for al Shabaab’s military operations told Reuters in Somalia his group had nothing to fear: “Where will Uhuru Kenyatta get the power with which he threatened us?” said Sheikh Abdiasis Abu Musab. The assault was the biggest single attack in Kenya since al-Qaida’s East Africa cell bombed the U.S. Embassy in Nairobi in 1998, killing more than 200 people. Al Shabaab’s siege underlined its ability to cause major disruptions with relatively limited resources. “In terms of capacity, while the group has grown considerably weaker in terms of being able to wage a conventional war, it is now ever more capable of carrying out asymmetric warfare,” said Abdi Aynte, director of Mogadishu’s Heritage Institute of Policy Studies. NBC terrorism analyst Evan Kohlmann said on the Sunday morning “Today Show” that al Shabaab is known to recruit members from the U.S., including in Portland, Maine. Kenyatta, who said Kenya was still trying to establish conclusively who was responsible, said women were among the 10 to 15 attackers. Asked whether hostages had explosives strapped to them, he said he would not comment on operational issues. Kenya’s deputy president, William Ruto, asked judges at the International Criminal Court in The Hague to allow him to return home to help deal with the siege and its aftermath. He and Kenyatta face charges of crimes against humanity for their alleged role in coordinating deadly violence after the contested 2007 elections, when they ran in rival camps. Both deny the charges. They won a vote on the same ticket in March. The dead in Saturday’s assault included children, and the wounded ranged in age from 2 to 78. More than 1,000 people were evacuated by security forces combing the mall, littered with shattered glass and pools of blood. An Israeli security source said that Israeli advisers were at the scene helping Kenya to work out how to end the siege. Kenya’s National Disaster Operation Centre referred to a “major engagement” on its Twitter account when a blast was heard. “It’s going on, it’s going good,” one Kenyan soldier who had been in the mall on Sunday told reporters as he left the scene. But later in the evening, the situation appeared calm. After emerging on Sunday morning from a hiding place under vehicle in the basement car park, a woman, giving her name as Cecilia, told Reuters by telephone she had seen three men in the attack who looked like Arabs, judging by their skin color. 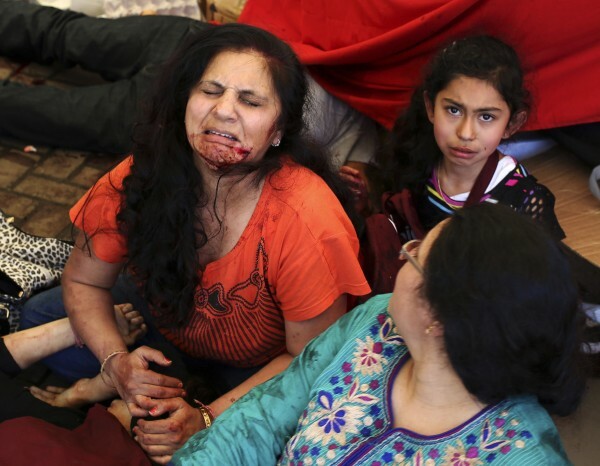 Witnesses said the attackers had AK-47 rifles and wore ammunition belts. One militant was shot and arrested early on in the siege, but died shortly afterward. 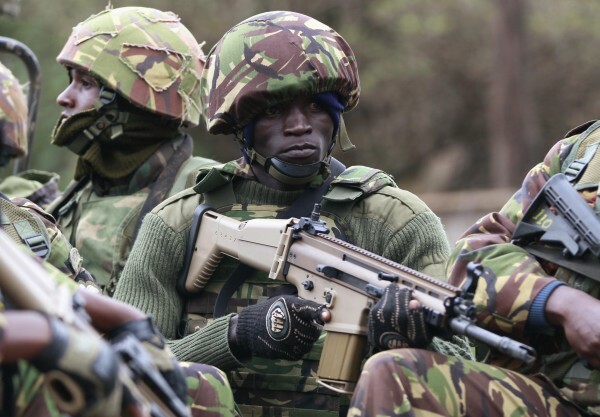 Al Shabaab, which is battling Kenyan and other African peacekeepers in Somalia, said Kenyatta must end their mission in Somalia, whose border lies 300 miles from Nairobi. Kenya sent troops into Somalia in October 2011 to pursue militants whom it blamed for kidnapping tourists and attacking its security forces. Al Shabaab’s last big attack outside Somalia was a twin assault in nearby Uganda, targeting people watching the World Cup final on television in Kampala in 2010, killing 77 people.